After our two nights in Vienna (which you can read about in Part 1 of this mini-series, if you haven't already), Johan and I spent our next couple of nights in Bratislava. We stayed right in the heart of the old town (Staré Mesto), which I highly recommend if you're also an enthusiast of cobblestone streets, narrow, winding alleys and colorful facades. I was in a near-constant frolic around the rainy streets, periodically exclaiming "THIS CITY!" or "look at these buildings!" Located just an hour's drive from Austria's capital is the historic, mid-sized city of Bratislava. Principal city of the Slovak Republic since the dissolution of Czechoslovakia in 1993, Bratislava is one of Europe's youngest capitals (though the city's written history dates back as far as the year 907). While Bratislava has largely been seen as an option for a day trip from Vienna, a port of call for river cruises on the Danube, or as a quick stopover on the way to Budapest, the city is gaining in popularity as a tourist destination of its own. I really fell in love with the place, intending not only to return to Bratislava as soon as I can, but to take a little time to explore more of Slovakia, too. For our first evening in Bratislava, I'd booked us an Urban Adventures tour—namely, a beer tour. I thought this would be a fun way to get to know the city and give us some ideas for how to spend the following day on our own. It really was a great time, and ended up being an unintentional private tour as Johan and I were the only ones to register (it was a Monday night, so that may have had something to do with the lack of participation). Our tour began at Meštiansky Pivovar, a restaurant and local brewery. We liked this place quite a lot and ended up returning the following day for lunch, where we enjoyed the delicious dish pictured here (second one down on the menu excerpt). Tangy, pleasantly earthy bryndza (sheep's cheese) stuffed inside chewy, pillowy potato dumplings (not quite gnocchi, not quite pierogi), topped with pieces of bacon, crispy onions, and a dollop of sour cream. Awesome. As we walked to the next stop on our beer tour, our guide, Klaudia, led us through SNP Square (Namestie SNP), which commemorates the anti-Nazi resistance movement of 1944 and has continued to be a gathering space for protests and peaceful demonstrations throughout the years. 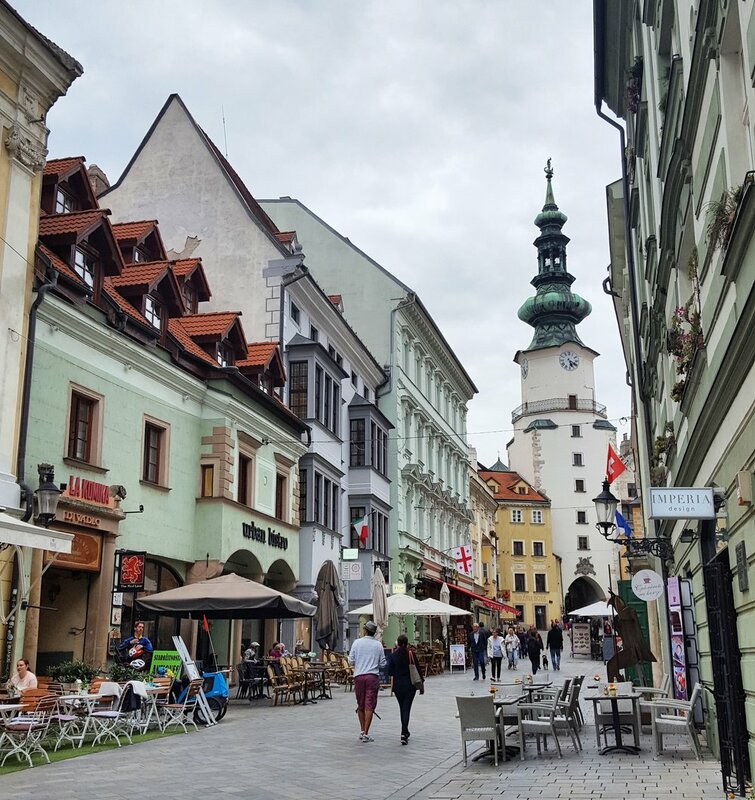 The three of us were chatting in English during the tour—English is the most common second language here, especially among younger folks—and we began to notice a middle-aged woman walking near us, speaking loudly in Slovak. I thought nothing of her at first, assuming she was on the phone or yelling towards someone on the street to get their attention, but then Klaudia started translating. Apparently this woman was annoyed that we were speaking English, was saying something about the perils of Americanization, and indicated that we should learn how to speak Slovak. She was not directly confrontational with us, just speaking as she kept walking and eventually passed by, but I found myself actually feeling a bit guilty. This is a nation that has seen tremendous change just in the last couple of decades; I can't even imagine what middle- to senior-aged folks have seen thus far in their own lifetimes. Today's Bratislava is peppered with trendy cafes and restaurants (think avocado toast, upscale burgers, craft beer) with English menus on display, retail companies that almost certainly didn't have a presence in the city until the fall of communism are everywhere, tourism is on the rise... There's a great deal of things happening. So yes, part of me thought, "c'mon lady, it's 2017, people travel! We're here to learn more about your city, not take over your culture!" while the rest of me—the part who is hyper-aware of the tension surrounding immigration in both the EU and the US, the part who can't rationalize the absurdities of the news pouring of the US on an almost daily basis—completely understood where this woman's frustration may have been coming from. I will assume she didn't speak much English, only because Klaudia was actively telling us about the city, gesturing this way and that as she spoke, and just a moment of eavesdropping would have revealed that she was educating us about local history; but it's instances like this where I wish I had the linguistic capability to convey my interest beyond the appearance of another tourist blowing through town on their way to somewhere else. This woman, boldly speaking out against a foreign language in her own streets, is precisely the type of person I wish I could sit down with and talk about what they've seen, what they've learned, what their impressions of society are. Our tour continued through a hole-in-the-wall dive bar, a brewery on a boat, and finished at a locale in the old town. We crossed the river to reach the boat brewery, and coming back we returned on the bridge you see above. That odd structure at the end of the bridge is fittingly called the UFO. There's a restaurant and observation deck at the top, and no doubt the panoramic views are stellar. Since the weather was exactly as it appears in the photo (worse, at times), we never did go up, but it's on my list for next time. The rest of our time in Bratislava was spent wandering around in the company of abundant raindrops. We went up to see the castle, which technically dates back to the 9th century, though it has [predictably] been through several phases of addition and restoration through the centuries. A massive fire broke out and destroyed most of the castle in 1811, where it then sat in a state of ruin for the next century and a half before reconstruction efforts began. The castle as it appears today was completed in 1968. If you're curious, you can learn more about the Bratislava castle here. You'll find excellent views across the Danube from the overlook at the castle (click to enlarge the panorama). Next, we set out to find the aptly nicknamed Blue Church, or the Church of St. Elisabeth. 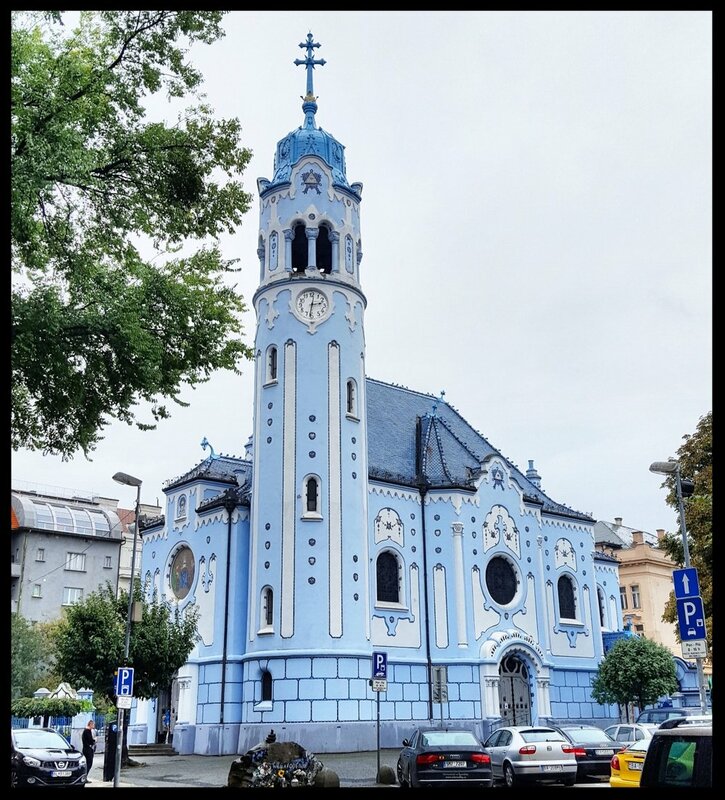 The Blue Church is a charming, fairytale-esque art nouveau building, consecrated in 1913 after a four-year construction period. The church was designed by Ödön Lechner, a Hungarian architect sometimes referred to as the "Hungarian Gaudi." While the church has very limited opening hours, you can peek through the windows in the foyer and catch a nice glimpse of the inside, which continues the theme of the exterior. Blue Church located and observed, we resumed our strolling. Given the undesirable weather thus far on our trip, I'd been casually lamenting the fact that I did not have a hat. How nice it would be to throw on a versatile hat and be able to hide the unattractive side effects of rain and damp breezes across my hair? Except...I'm not a hat person, so this wasn't even a matter of having forgotten to pack a beloved hat; I didn't own anything suitable in the first place. Then we found ourselves in front of a hat store. I'll skip the play-by-play of my trying on several variations and sizes because that is boring for everyone involved, but I do want to tip a metaphorical hat to, well, hat stores. Real hat stores. The types of shops you walk past and maybe briefly wonder how they're still in business in this age of the internet and rampant consumerism. This is a bit of an aside, but I've now had two separate hat-buying experiences (the other here in Nuremberg) and I cannot speak highly enough of the ladies who have helped me at these specialty stores. They've been so tolerant of my repeated tryings-on, poking around the racks at different styles, struggling to come to a conclusion as they offer their own suggestions. I'm not sure if this is an industry standard sort of thing, or maybe older women who work at hat shops are just truly passionate about millinery, but whatever their secret is has helped me in taking the steps to becoming a Hat Person. After the mentally taxing task of buying this hat (that I wouldn't even end up wearing for another two days), we needed a drink. We happened upon Cuba Libre, which looked awfully enticing from the outside, with its warm glow and polished bar offering respite from the rain. The drinks were fabulous and we went back again after dinner later that evening. If you fancy a nice cocktail and find yourself in Bratislava, do pay a visit to Cuba Libre on Laurinská. The following morning, Wednesday, we were due to continue on to Budapest. Once again, it was raining and also this time quite windy. 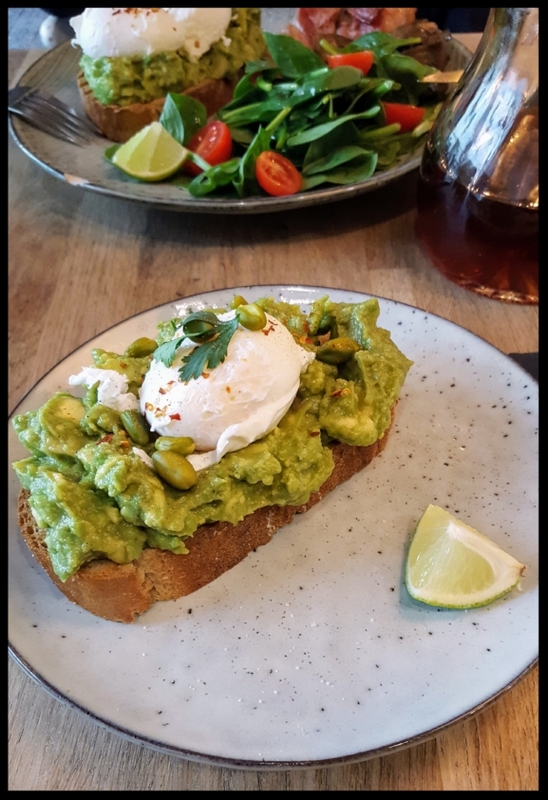 While I'd have loved to hang out in Bratislava a little longer, this unfortunate weather made the upcoming two-hour drive seem like a more pleasant way to pass the time, so we found a bite of breakfast at Urban Bistro (just have a look at this avocado toast—those pistachios! that poached egg!) and bid Zbohom to what is now one of my favorite cities. Stay tuned for Part 3: Budapest!